My niece had fun blowing out the candle as we sang Happy Birthday to her. 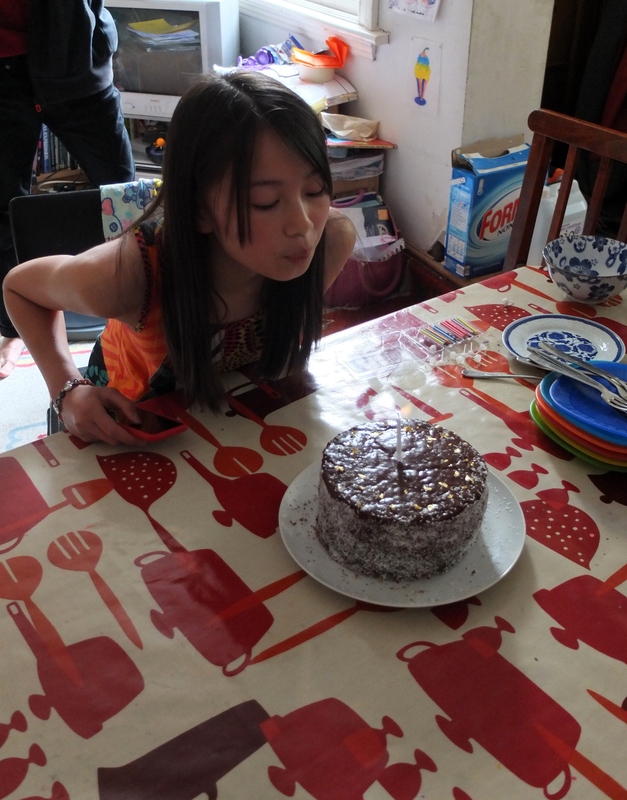 She’d already had a birthday cake earlier in the week but there’s no limit on this kind of thing. So we thought her brother Oscar (whose birthday followed hers by one day) should blow a blue candle out! More singing! We were getting a lot of mileage out of just one cake! And so much fun we offered to repeat the singing and candle-blowing ceremony for my younger nephew. 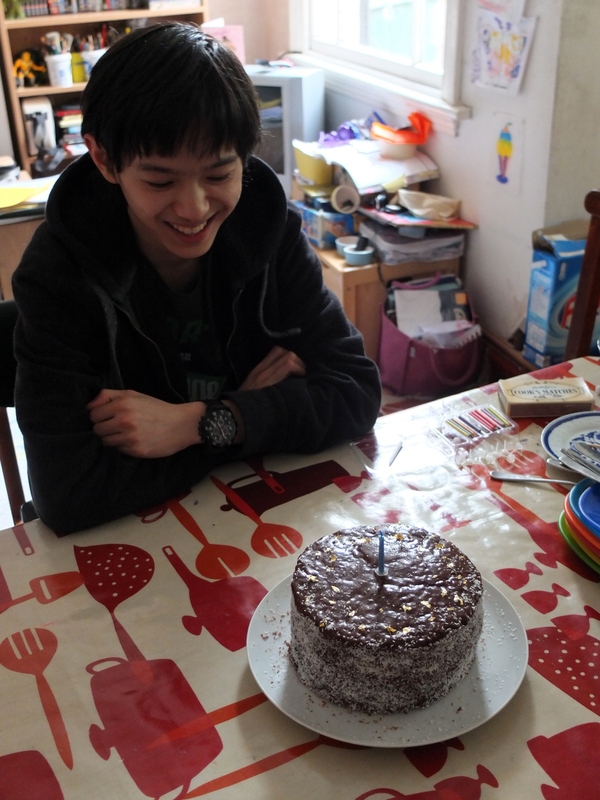 He sensibly declined, saying his birthday had been ages ago in February. Then came the crazy moment. I cut two slices of cake. Gasps. My brother walked away ‘I’m not eating that!’ Not unexpected. Enter the brother back-up plan B: that healthy fruitcake he later tucked into and loved. He enjoyed getting a bit drunk on the rum in it. 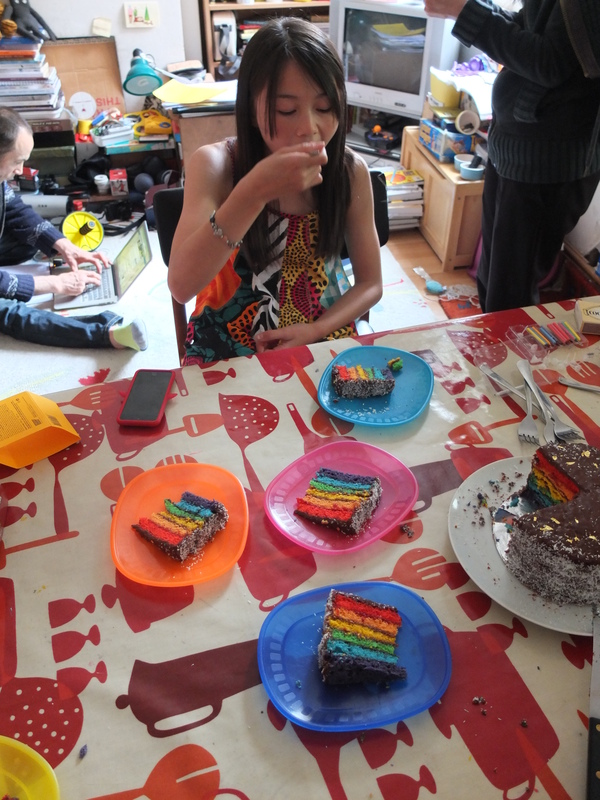 Meanwhile the rest of us started into the colourful cake! 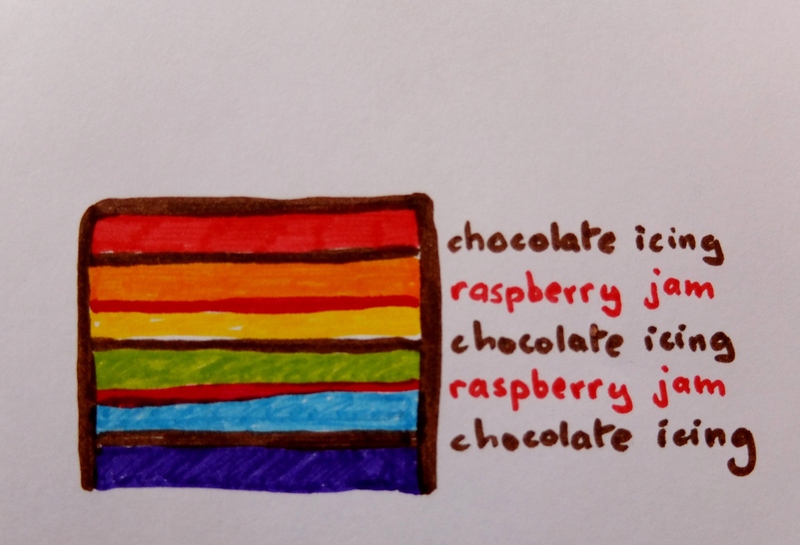 I am very partial to rainbows. We learnt to order the colours of the rainbow at school with Richard of York Gained Battles in Vain ( Red, Orange, Yellow, Green, Blue, Indigo and Violet). Good, eh? Feel free to do the seven layers if you prefer but here we’ll be doing six and merging indigo and violet into a kind of purple-ish layer, which is hidden underneath somewhere in this photo! What I learnt recently is the natural food colourings I bought are ‘not very effective’. 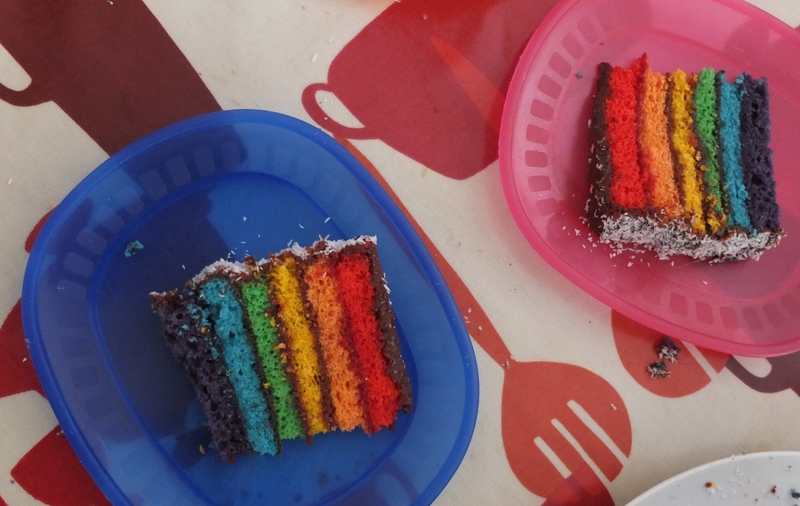 They were producing some yukky palid colours in my cake mixtures so I’m afraid I threw in old-fashioned food colouring gel and hey presto, proper rainbow colours! 🙂 or 😦 ! In Kaitlin’s original recipe a butter sponge is used that you could do instead. 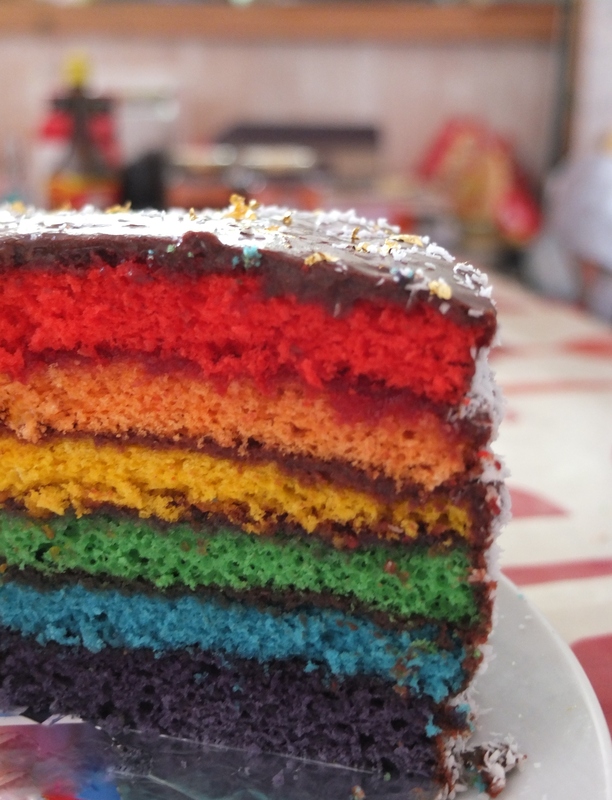 Here’s the link to her Super-epic rainbow cake, including a video of her making it with Martha Stewart so you can observe the layering process. You’ll also see Kaitlin is as cheerful and friendly as her cake. No worries, if you’d like a nice simple and easy option I do encourage you to go over to Kaitlin’s recipe. 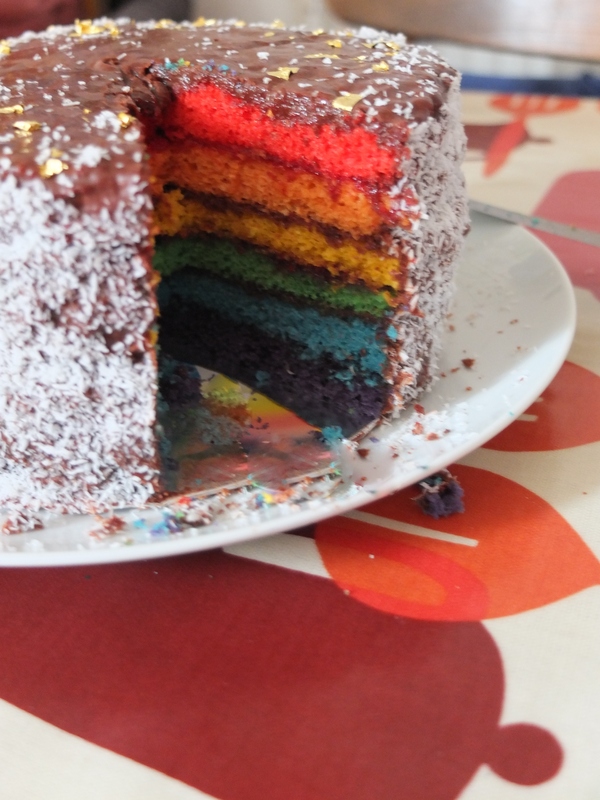 Or to the Baking Hermit’s go-to rainbow cake, which inspired me to take the plunge and make this one. I’m planning to make hers one day, with the lemon cream cheese buttercream! 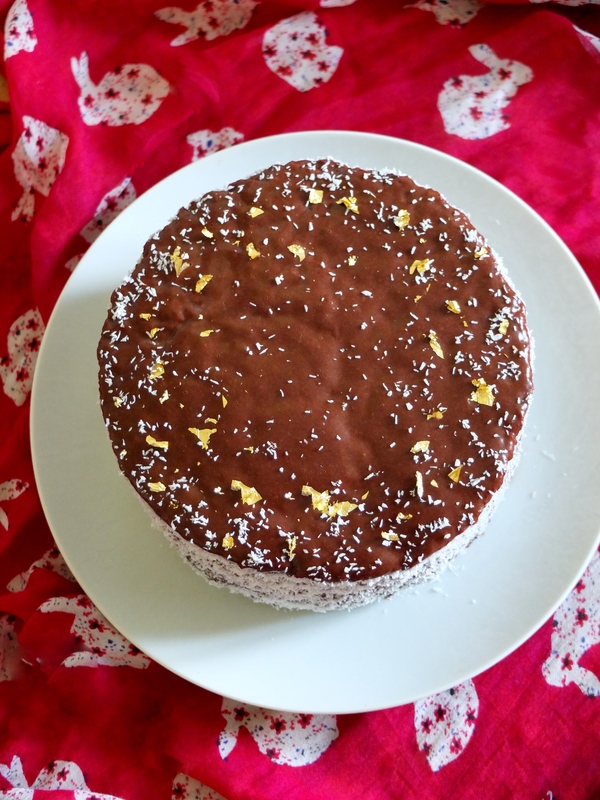 This time round Australian Lamington cakes, dipped in cocoa icing and rolled in coconut, were a big inspiration. 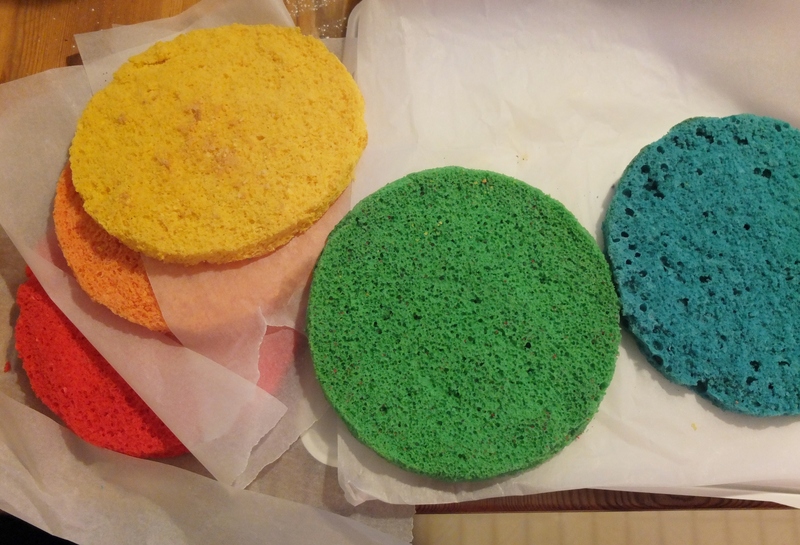 To get a spongier lighter cake you’ll need to bake layers in three batches. Sorry. 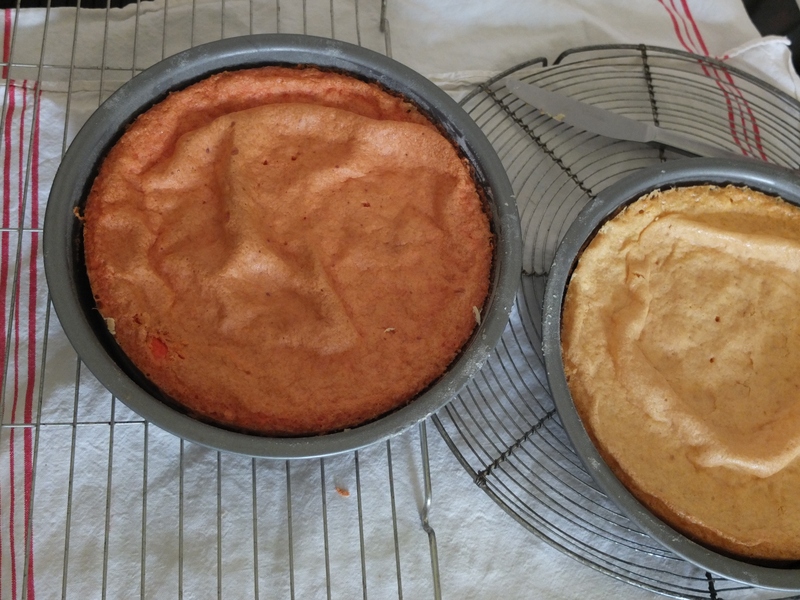 I’ve tried making three layers at a time, but two always came out dodgy: flatter and sadder because this delicious genoise sponge with baking powder isn’t built to hang around waiting to go in the oven. So you cut down on waiting time doing just two layers simultaneously, and putting them in the oven fast. The chocolate icing, layering and glazing are all dead easy. 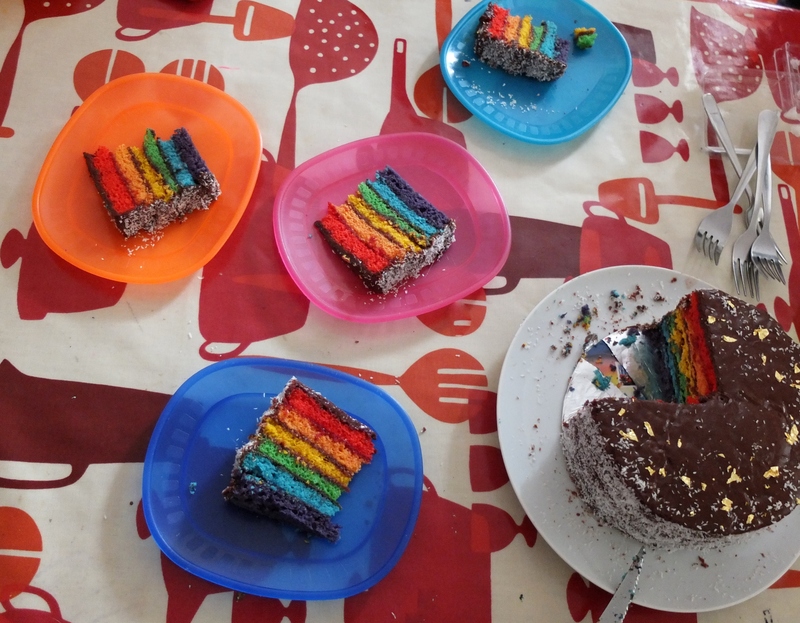 Of course as this is a special cake you’ll make time and imagine the look of wonder and delight on someone’s face when the cake is cut and they see your rainbow! Better than the mythical pot of gold at the end of it. Quick snowstorm alert: measure, pour and sift the cornflour gently so it doesn’t rise up in a white cloud covering you and all your surroundings. You could shuffle innocent bystanders away from the immediate vicinity and cordon off the area. Check your 2 round baking tins (around 20cm diametre) fit on one rack in the oven. Butter them lightly then place a circle of greaseproof paper at the bottom, then flour the sides. 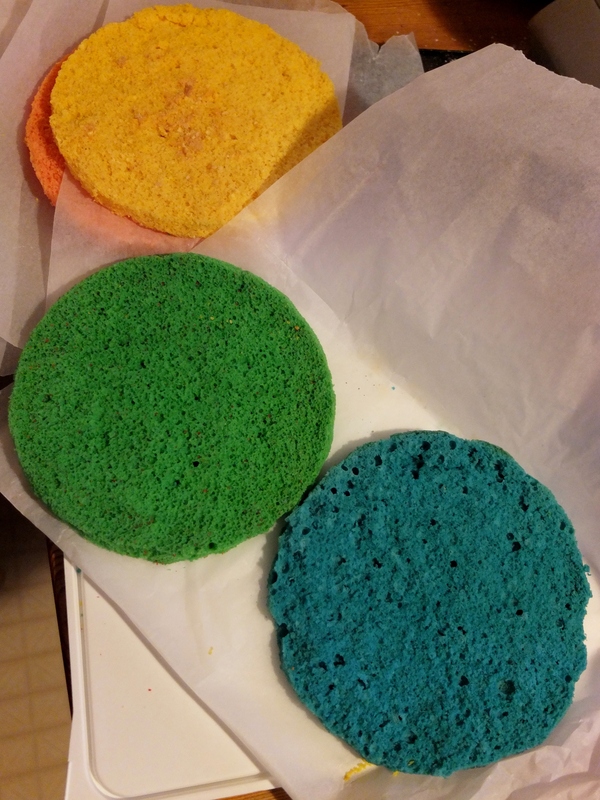 quarter tsp or less food colouring gel or powder: red, blue, orange, yellow, green and violet. 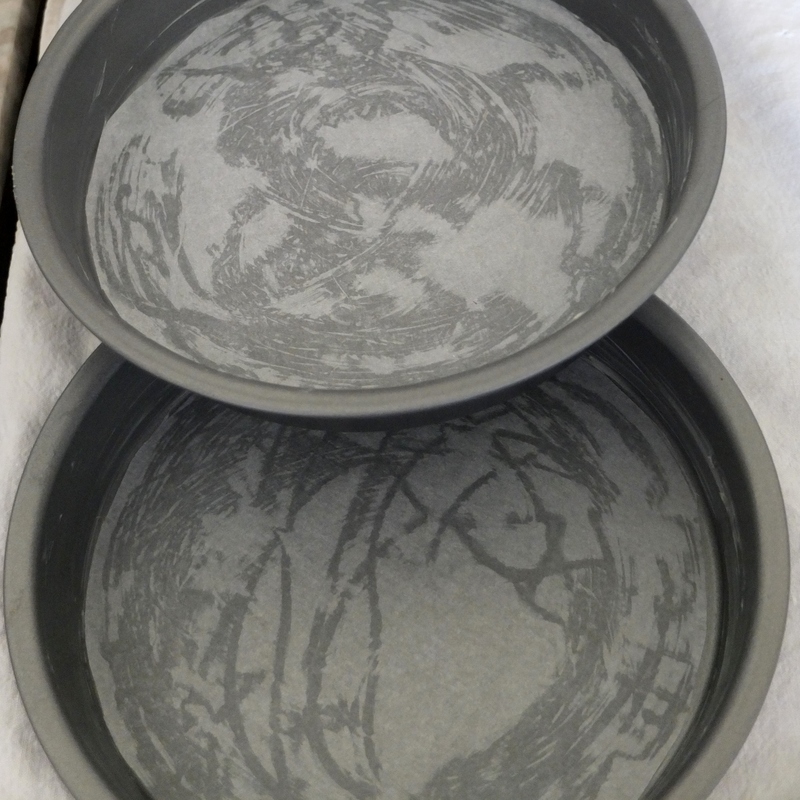 Separate the whisked/sifted cornflour and baking powder into two smallish bowls (52g/1 cup in each). Beat the eggs, sugar and salt on high with the stand mixer 15 minutes. Or by hand around 30 minutes. It should be pale and fluffy, increasing substantially in volume. Add the vanilla seeds or extract and whisk for a further 5 minutes, or 10 minutes by hand. You want the mixture to have tripled in volume and be very pale and fluffy so when you let some drop from your whisk it forms a ‘ribbon’ on the surface. Now you’ll need to separate this mixture into two bowls (have the bowl on the weighing scale then tare it to zero) – each bowl should have around 145 grammes of the mixture. 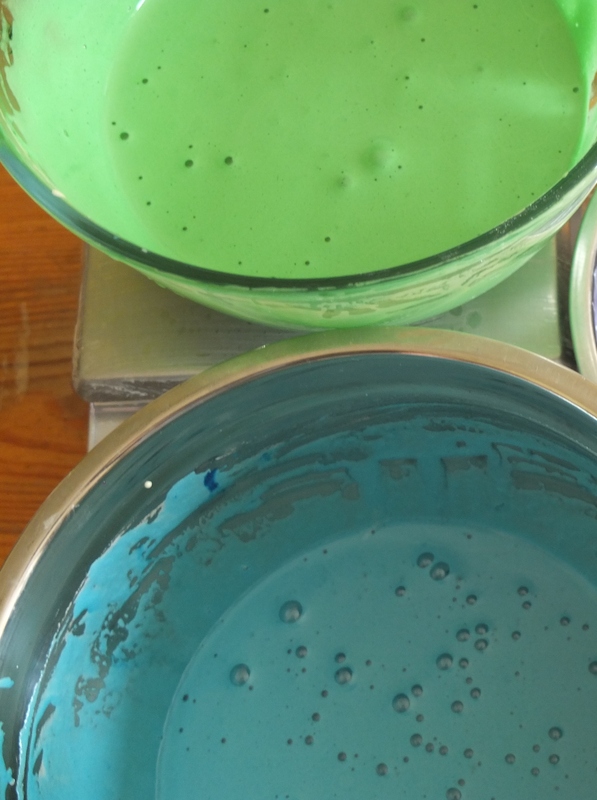 Whisk in some food colouring into each bowl, till well combined. With a rubber spatula or slotted metal spoon gently fold in one lot of cornflour and baking powder into a bowl of sugar/egg mixture. Use smooth figure of eight movements and don’t overwork. 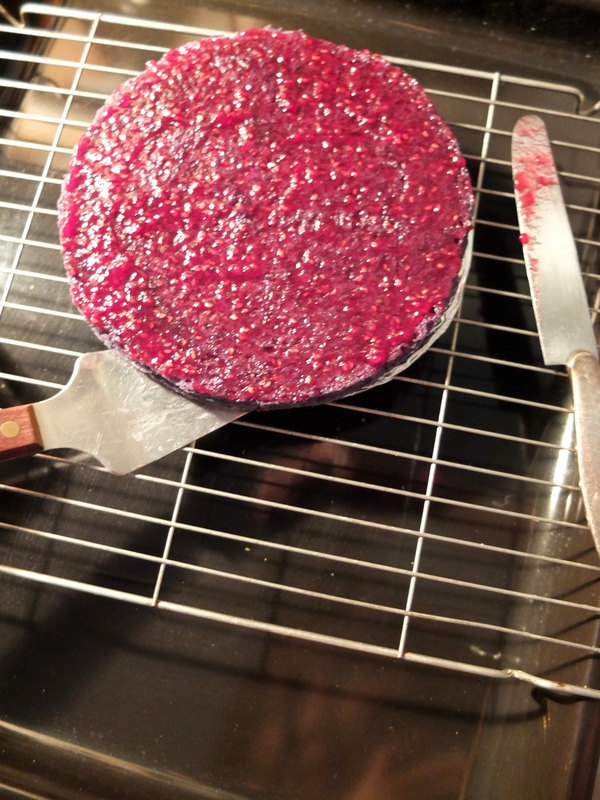 When just combined pour gently into a cake tin. 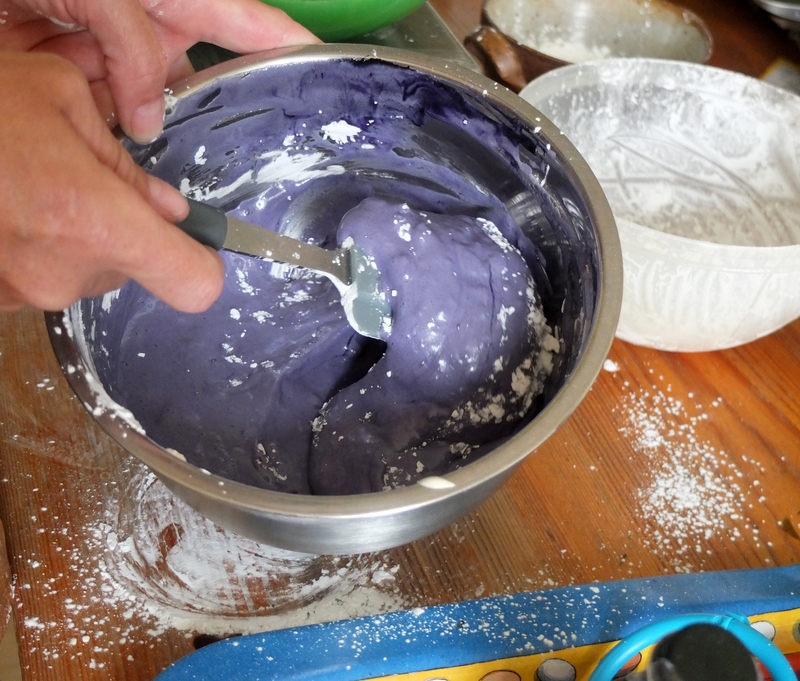 Repeat this process for the other coloured mixture. Work as fast as possible so no mixture is hanging around too long before going in the oven. Once your six layers have cooled trim them to equal height. You can use a long serrated bread knife to slice the uneven top off and the bottom (you can see a slicing method with books in step 4 of my Moka cake recipe). Assemble the cake immediately or store your layres in airtight tupperware at room temperature, have a rest and do it the next day! Make the chocolate icing by sifting the icing sugar and cocoa into a heatproof bowl. Whisk in the melted butter and 180g/1 cup of the milk. Add more to thin the icing if necessary. Taste to check if you need more sugar or cocoa (to taste). 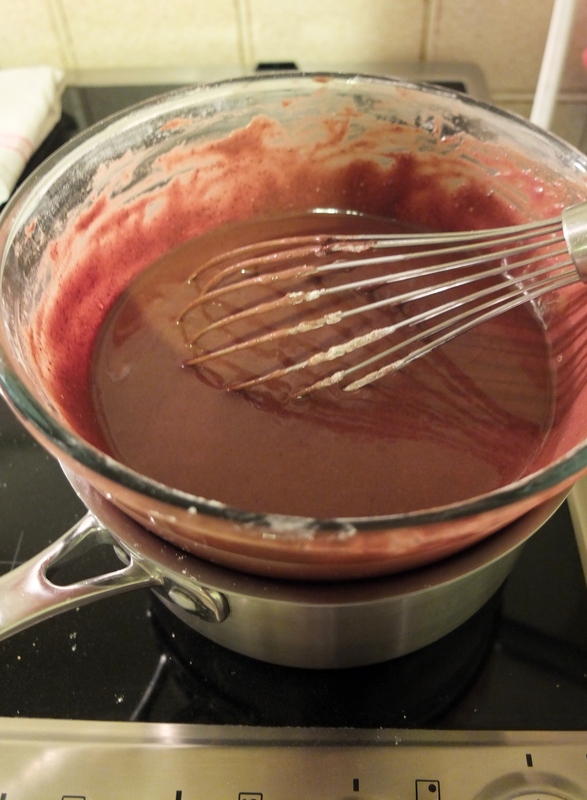 Whisk over a bain marie (a little water that’s simmering gently on a low heat) – the water should not touch the bowl. You want an icing that’s liquid enough to cover a cake with a thin layer but not too runny or thin. 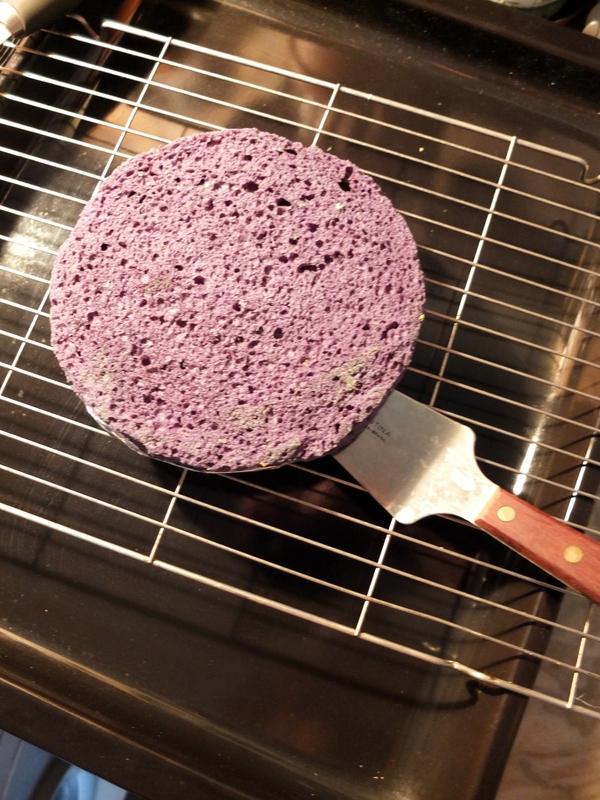 Place your bottom layer on the foil or gold circle and place on a wire rack over a large baking or oven tray. 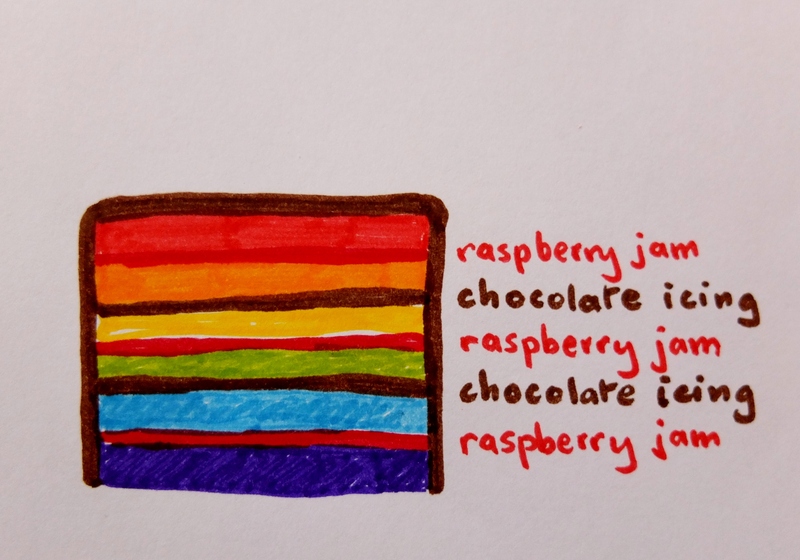 Spread a layer of chocolate icing or raspberry jam on your layer. 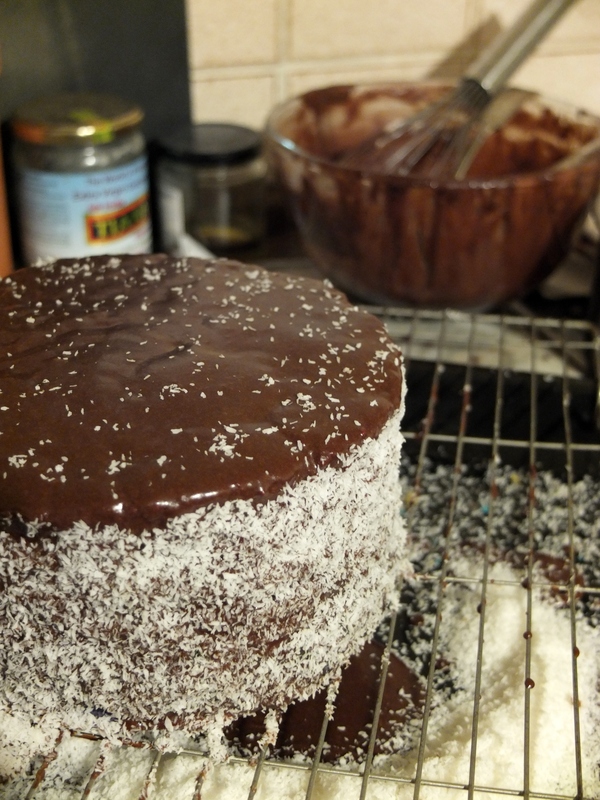 The chocolate icing layer should be slightly thicker. 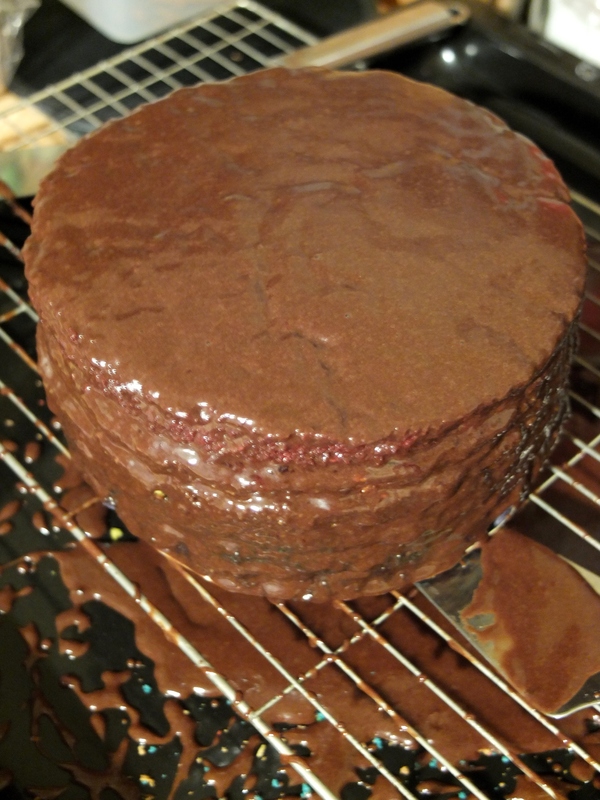 Top: once your final layer is done, pour some chocolate icing on top of your cake. It should spread out without using a spatula knife. The top will stay shinier if you don’t touch it. Sides: use a butter or spatula knife to spread the icing on the sides and cover it evenly. Then recuperate the chocolate that’s fallen through the wire rack into the tray and store in an airtight container in the fridge for another time. Clean and dry the tray below the cake. Place the coconut in the palm of your hand and press against the sides to cover. You can reuse any coconut that’s fallen into the tray. 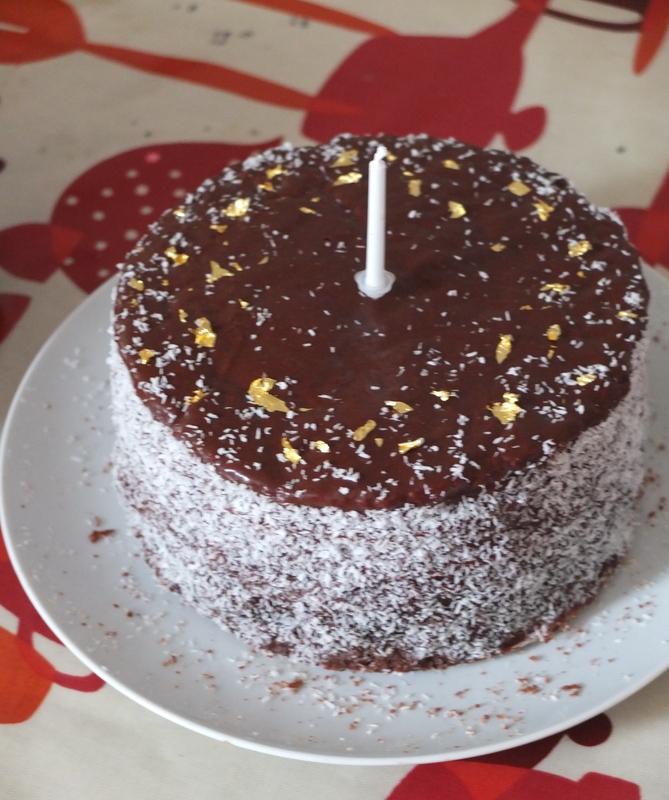 Finish: sprinkle a little coconut around the sides on the top and add a pattern of edible gold paper. Or create your own design. 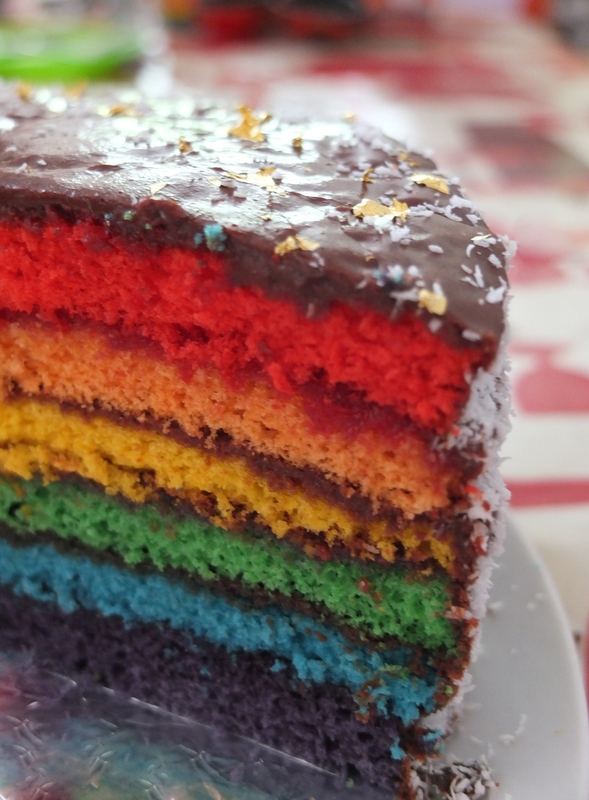 I’m very late, but I’ll take this crazy cocoa and raspberry rainbow cake along to the Fiesta Friday party – it might raise a laugh or two! 🙂 With grateful thanks as always to Angie@the novice gardener for hosting this great event and to her co-hosts this week, Juju @ cookingwithauntjuju and Amanda @ The Chunky Chef. 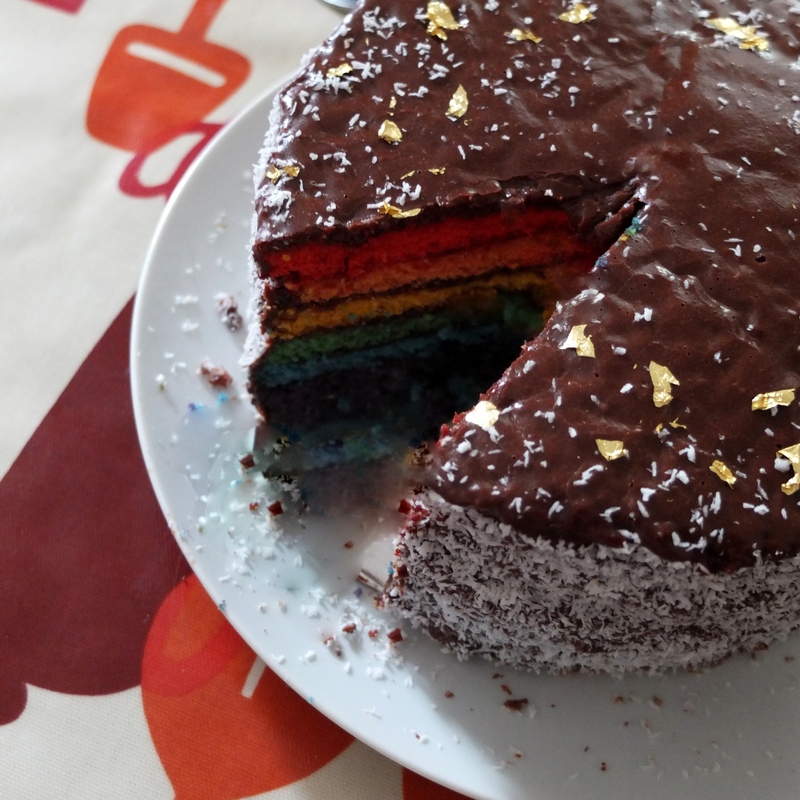 Cocoa and raspberry rainbow cake! Do you dare have a slice of it?! 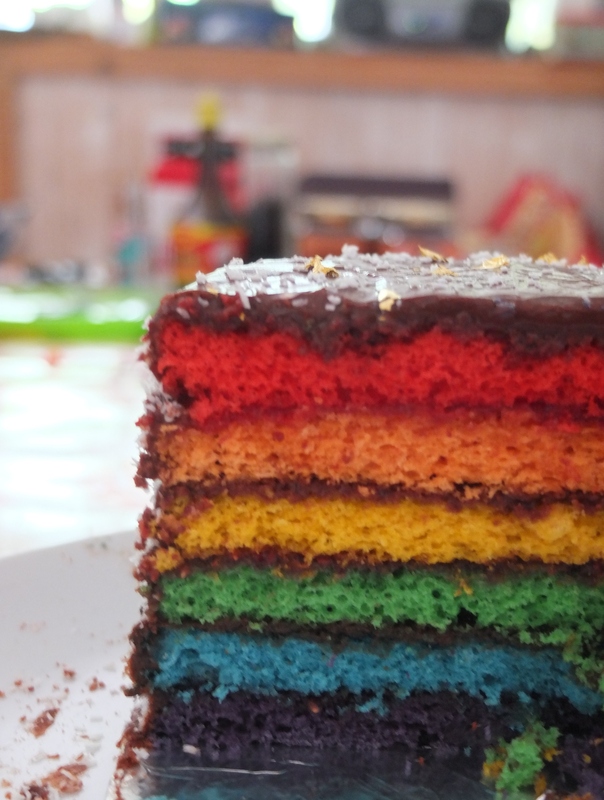 A slice of rainbow cake?! So cool, Lili! 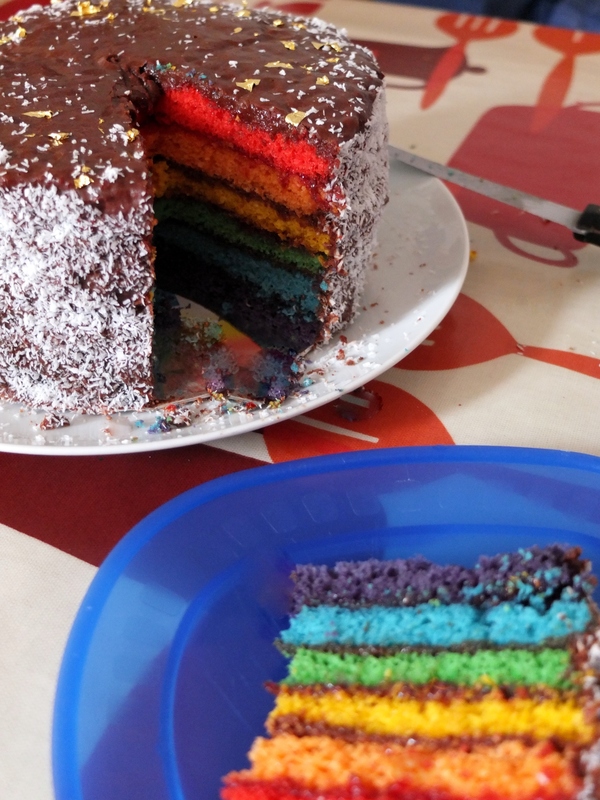 I want a rainbow cake for my birthday too. Have a great week! What a fun and beautiful Birthday cake! I’m so glad it tasted delicious, and your niece loved it. 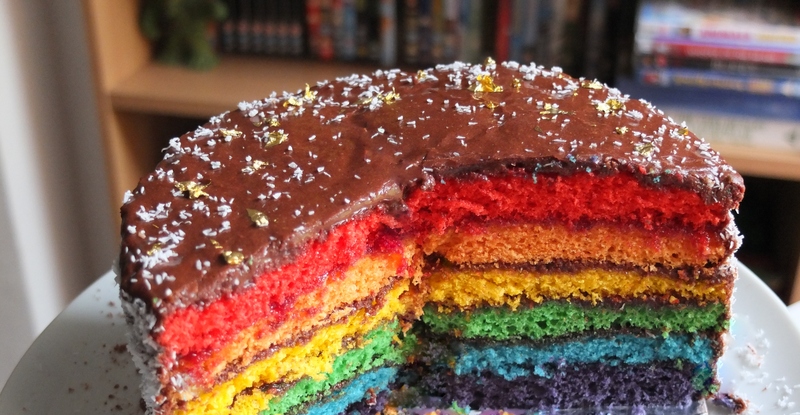 This is such a cheerful looking cake! What a shame the natural colourings aren’t very effective. . .
You are quite the baker Lili… wow-weeeeeee! If this were baked for my birthday, I would lock all my doors and make sure nobody else shared it :). Super duper! !